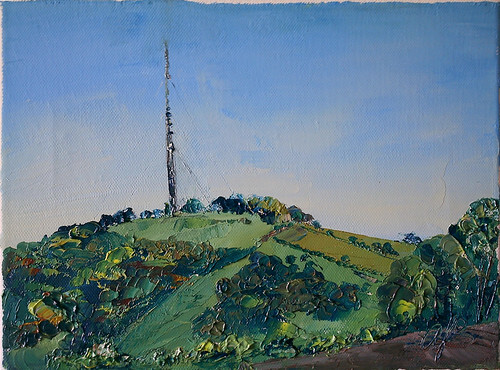 After I'd finished the view of Watership Down, I turned round and painted Cottington's Hill, upon which is our local TV and radio mast, Hannington Mast. You can see my favourite patch of access landon this image; the slope directly below the mast is Stubbington Down, from which I made several paintings of Cannon Heath Down. 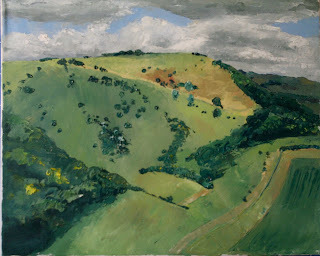 In an attempt to find a good vantage point for this famous hill, I struck out across the valley floor, on a footpath that followed a lowland gallop and that ultimately ventured up the down itself. 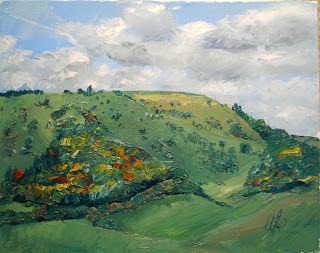 But there wasn't time to walk up the hill and paint it, so I saved the climb until a later date (with worse weather - the Indian summer is still here, with temperatures higher, it seems, than the "real" summer) and settled down with a pair of small canvases and my usual painting kit. This was today's first painting. 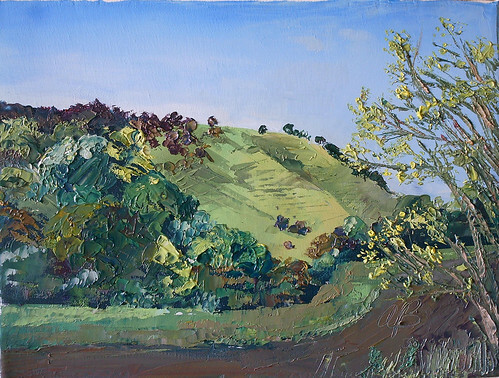 After I'd finished it, I turned around and painted Cottington's Hill from the same position. Oil on canvas, 12 x 9". The weather today, 28th September 2011, was glorious: hot and sunny, real Indian summer weather. I took up position not far from where I painted the last view, and this time I included some of the foreground foliage (instead of ignoring it, like I did last time). The 23rd of September was a gloriously sunny day, and it yielded this, the fifth of my paintings of Cannon Heath Down. I positioned myself a little lower down the hill I was sitting on this time; this is evident from the fact that you can't see all of the stands of trees that were visible in previous views. The autumn is setting in now; you can see that in the wonderful colours of the trees. Of course, what you can see isn't the true colours of the painting (let alone those of the trees), because there is so much technology between your eyes and the canvas. First of all, you have to contend with the rather idiosyncratic colour balance of my digital camera (an inexpensive point and shoot model). The camera applied a ghastly blue cast to this image of the painting for some reason known best to itself. It needed fixing. To start with, I applied an auto white balance using Corel Photobook (an Adobe Photoshop analogue). That seemed to overcompensate, making the trees garishly orange. I tried again, fiddling with the colour balance manually, and this is my best attempt. After that, of course, the colours get mashed around by the screen settings of the computer you're using to view the image. Seeking to make amends for the recent bad painting, I returned to my favoured hillside on the 13th of September. The day was a bit blustery, and I had to catch the canvas a few times, but the weather was quite a bit more clement than it had been on my previous expedition. I'd also taken the precaution of wearing an extra layer of clothing, which helped. My third painting of Cannon Heath Down didn't work so well. In fact, I'm not very happy with it at all. The weather that day (the 27th of August, 2011) was cooler, windier, and wetter than on my previous expeditions, and I learnt an important lesson about painting outside: it is very difficult to paint well if you are cold. I usually start with the sky, and I was feeling cold before that was done. I think I hurried the rest of it, refusing to give up, and consequently botched the image. There are a few passages that I think worked well; the trees, painted light-over-dark in the time-honoured tradition of oil painting, aren't bad. But on the whole, I don't like this one. I'm including it because it is part of the series and to illustrate why it is a bad idea to paint when you are physically uncomfortable. This is my second painting of Cannon Heath Down, a hill in North Hampshire, painted on the 24th of August, 2011, from a more precarious pitch on the patch of access land mentioned previously. 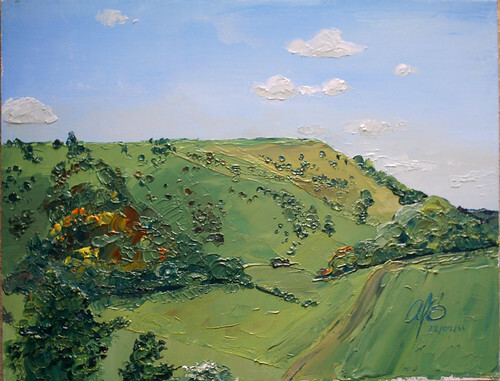 The weather was quite sunny that day, and I don't recall having any trouble with rain, although the wind was a bit gusty and I had to stop the canvas from launching itself onto my lap a few times. This is my first painting of Cannon Heath Down, a hill in North Hampshire. 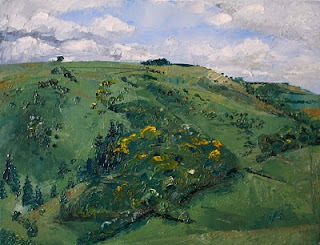 It was painted on the 17th of August, 2011, from the opposite side of the pass that goes through the downs at that point; there is a lovely (and rather steep) patch of access land on White Hill that affords an excellent view of Cannon Heath Down and its intriguing hollows. 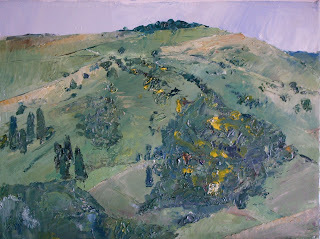 The day was a bit grey, and I did endure a light shower - the painting didn't mind (being executed in oils, it is naturally water repellent), and I was dressed for the weather, but I had to cover my cardboard painting carrier with a plastic bag and my tear-off palette pad went a bit wrinkly. Oil on canvas, 30 x 40cm. Hello. This is my art blog. I'm going to use it to post a few paintings, some practical information, and any relevant news. I'm a mother of two who lives in North Hampshire in England. With both children finally at school, I found myself inexplicably unemployed (well, there are an assortment of factors, but let's leave boring stuff like that at the door; this is about the art). I don't have an art degree (I've got a couple of science ones, though), although I do have an 'A'-level and a few oddments of tuition picked up here and there. 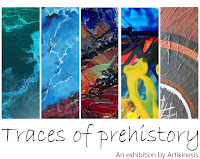 I'm reasonably aware of Art History, and I suppose I ought to declare an affinity for the Impressionists, although any similarity between my recent work and their historical pieces is more of a happy accident than a deliberate choice. I'm inspired by nature and by everyday objects. I have a particular interest in landscape painting, which I prefer to do on location or, as, the Impressionists used to say, en plein air (literally, "in the open air"). 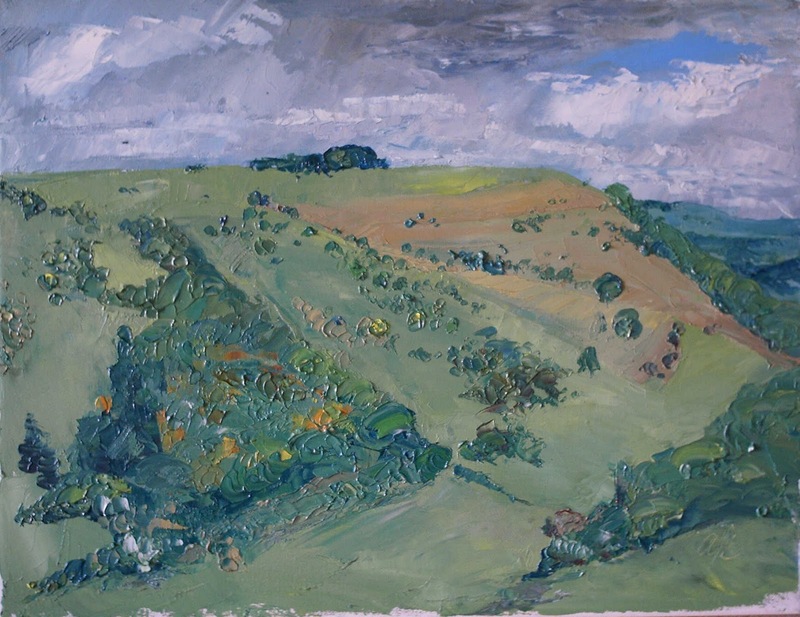 I've recently spent a lot of time on the local downs - some of it walking (and checking out the views), some of it painting. I'm lucky enough to live within walking distance of these splendid hills, and I'm trying to take advantage of that by avoiding the use of the car where possible. Update: Now working full time again, I'm finding it harder to make time for painting - but I'm still managing to do so!